Improved by our tremendous modern involvement around here, we are included in assembling and sending out a colossal quality scope of Power Energy Meter Calibrators. This Calibrator is the most financially savvy approach to get the unrivaled precision and execution of three autonomous stages in one instrument. It is a perfect answer for alignment research facilities, gadgets producers, electric utility meter shops, and different associations that fabricate and keep up vitality meters, control quality analyzers, and comparable devices. Combining outstanding quality and value, our organisation is offering a qualitative range of Three Phase Energy Meter Calibrator. 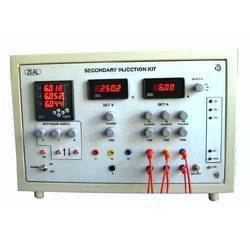 Our experienced professionals manufacture these calibrators in accordance with the international quality standards. Further, to ensure that clients receive only defect-free products, our quality controllers carefully test the entire range on various pre-defined parameters. PF Range 0.1 Lag to Unity to 0.1 lead to Unity. We have been manufacturing and supplying a wide range of immensely qualified range of these Secondary Injection Kit range that can be availed from us at the most comprehensive prices. These products offered by us have been in wide demand for the quality and accuracy features. These are available at market leading prices. Setting By coarse and fine set of potentiometers for Voltage and Current. Power Factor Setting by push button keys. Programmable current display to accommodate any CT ratio. Looking for Power Energy Meter Calibrators ?